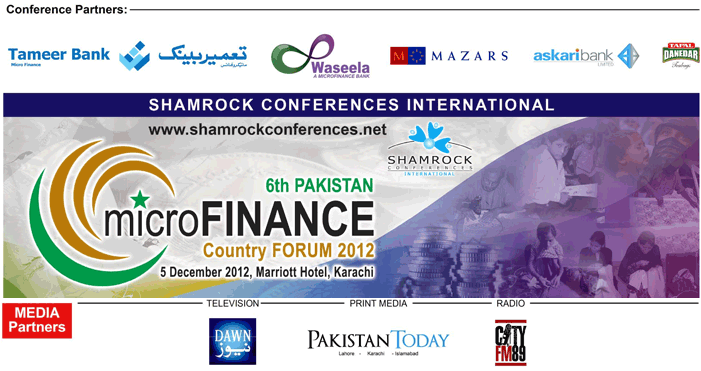 6th Pakistan Microfinance Country Forum expects high-profile participation. 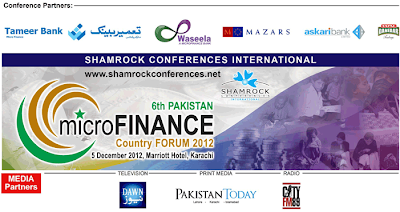 KARACHI: November 21, 2012 – The 6th Pakistan Microfinance Country Forum 2012 organized by Shamrock Conferences International in collaboration with Tameer Microfinance Bank, Mazars Asia-Singapore and Askari Bank Limited, will be held on December 5, 2012 at the Marriott Hotel, Karachi. Governor State Bank of Pakistan Mr. Yaseen Anwar will be inaugurating the conference. The theme of the forum is “Re Strategizing the Model - A New Face to Microfinance in Pakistan” and will include case-study discussions and face-to-face deliberations in a U shape setting of key stakeholders. Nadeem Hussain, President & CEO, Tameer Microfinance Bank; Mr. Mohsin Ahmed, Chief Executive Officer, Pakistan Microfinance Network (PMN); Mr. Ahmed Jamal, Senior Group Head, Pakistan Poverty Alleviation Fund (PPAF); Mr. Mudassar Aqil, President & CEO, Kashf Microfinance Bank; Mr. Ghazanfar Azzam , President & CEO, Waseela Microfinance Bank and Mr. Faizan Mustafa, Mazars Asia-Singapore, among others will be presenting on the occasion. The annual forum aims at gathering prominent experts, regulators, government officials, NGOs, academia, media and delegates from prestigious Pakistani & foreign Microfinance institutions. The day-long conference will include interactive discussions in which eminent speakers and practitioners will examine current milestones, issues and re-evaluate the current policies to resolve operational bottlenecks in the growth-path of this essential sector. Participation in the Forum is limited; therefore, those interested are invited to visit the website: www.shamrockconferences.net for registration and further information.